438, Lot: 439. Closing Feb 20, 2019 at 12:26:20 PM ET. Augustus. 27 BC-AD 14. AR Denarius (18mm, 3.62 g, 6h). Uncertain Spanish mint (Colonia Patricia?). Struck 19-18 BC. 438, Lot: 468. Closing Feb 20, 2019 at 12:36:00 PM ET. Claudius. AD 41-54. Æ Sestertius (34mm, 25.87 g, 6h). Rome mint. Struck AD 41-42. 438, Lot: 479. Closing Feb 20, 2019 at 12:39:40 PM ET. Galba. AD 68-69. Æ As (27.5mm, 9.42 g, 6h). Rome mint. Struck circa October AD 68. 438, Lot: 499. Closing Feb 20, 2019 at 12:46:20 PM ET. Domitian. AD 81-96. Æ As (27.5mm, 9.91 g, 6h). Rome mint. Struck AD 85. 438, Lot: 544. Closing Feb 20, 2019 at 1:01:20 PM ET. Philip I. AD 244-249. 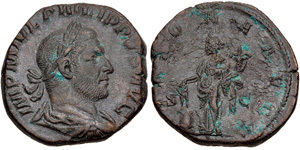 Æ Sestertius (27mm, 16.49 g, 12h). Rome mint, 5th officina. 5th emission, AD 246. 438, Lot: 556. Closing Feb 20, 2019 at 1:05:20 PM ET. Philip I. AD 244-249. Æ Sestertius (29mm, 15.64 g, 12h). Ludi Saeculares (Secular Games) issue, commemorating the 1000th anniversary of Rome. Rome mint, 6th officina. 9th emission, AD 248. 438, Lot: 565. Closing Feb 20, 2019 at 1:08:20 PM ET. Philip II. AD 247-249. 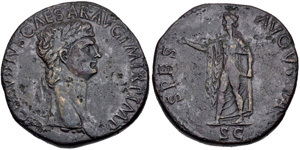 Æ Sestertius (28mm, 10.46 g, 12h). Ludi Saeculares (Secular Games) issue, commemorating the 1000th anniversary of Rome. Rome mint. 9th emission of Philip I, AD 248. 438, Lot: 570. Closing Feb 20, 2019 at 1:10:00 PM ET. Marius. Romano-Gallic Emperor, AD 269. Antoninianus (21mm, 2.68 g, 12h). Treveri (Trier) mint. 2nd emission, mid AD 269. 438, Lot: 598. Closing Feb 20, 2019 at 1:19:20 PM ET. Constantine I. AD 307/310-337. Æ Follis (20.5mm, 2.38 g, 7h). Treveri (Trier) mint, 1st officina. Struck AD 322-323. 438, Lot: 600. Closing Feb 20, 2019 at 1:20:00 PM ET. Commemorative Series. AD 330-354. Æ Follis (15.5mm, 2.51 g, 6h). Rome mint. Struck AD 348. 438, Lot: 609. Closing Feb 20, 2019 at 1:23:00 PM ET. Procopius. Usurper, AD 365-366. Æ (19.5mm, 2.96 g, 12h). 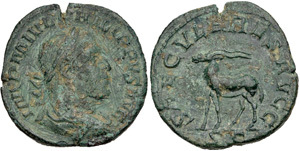 Constantinople mint, 3rd officina.